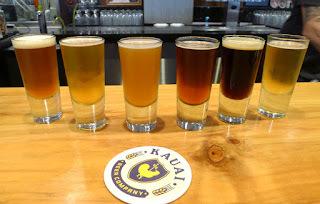 I first visited the Kauai Beer Company back in the fall out 2013. They had opened their doors about a month earlier and the place was pretty stripped down. Owner Jim Guerber had a plan to build the business piece by piece, and that's exactly what he's done. Back in those early days, they were pouring only four of their own beers. The flagship Black Limo, a schwartzbier, was at the top of the list, and a nice interpretation of the style. Except for a crock pot containing some chili or stew, there was no food. That and more beer was yet to come. The original post is here. I returned to KBC the following April, commissioned to cover the brewery for a BeerAdvocate piece. 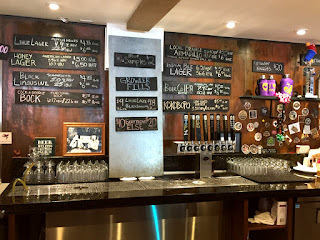 That's when I had the chance to sit down with Guerber and his compatriots...his son and head brewer, Justin, marketing director, Larry Feinstein, and brewer, Eric Burda (who recently left the building). I don't know how many times I've listened to brewers describe grandiose plans that sounded totally delusional. More times than I want to think about. But I never had that feeling with Guerber and his crew. Their plans to brew more beer, bring food into the mix and expand the operation in various ways sounded pretty reasonable. That was likely because I could see Guerber was taking a cautious approach to the business. An accomplished homebrewer and owner of a custom software company, he thought his brewery could be successful. Having made the substantial original investment required to get the doors open, he was determined to build things out as the business grew. When I next visited in late 2015, it was clear that things were evolving. There were more house beers pouring and they had expanded from food trucks (which appeared on special nights) to an in-house kitchen serving lunch and dinner several days a week. The space still had something of an unfinished look, but they had made good progress. This week's visit confirmed what I suspected all along, which is that these guys would build a thriving business. I walked in during a weekday lunch hour. The place was buzzing with activity, many of the tables and most seats at the bar taken. 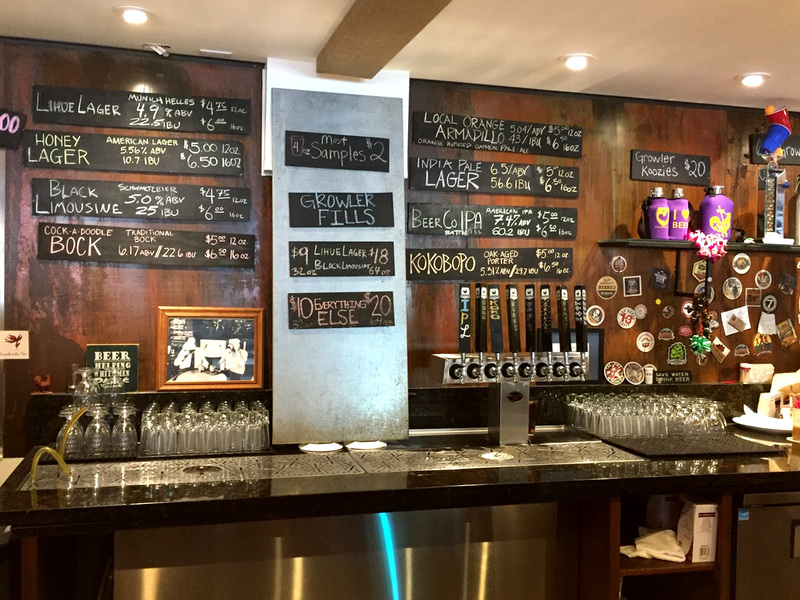 The place now looks like an established brewpub, with a good selection of beers, a locally-sourced menu, friendly ambiance and schwag. Most KBC beers are designed for the tropical climate. They tend to be fairly light on the ABV scale. The flagship Black Limo (5.0%) continues to be a favorite of locals and tourists. Lihue Lager (4.9%) is essentially a co-flagship with a strong following. My clear favorite from the rest of the list this time around was a robust India Pale Lager (6.5%), loaded with hop flavor and aroma. The menu is island fare, a mix of sandwiches, salads, soups, entrees and appetizers. Lunch and dinner options are slightly different. They also have Truck Stop Thursdays, in which two or three food trucks pull up out front and sell their stuff to patrons. This is how KBC initially brought in food, considered a special event. It continues on in that form and is well-supported. I didn't expect any special treatment. But Jim and Justin came round to talk and gave me a renewed tour of the facility. They revealed new plans for expanded brewing capacity, a larger kitchen and a beer garden, all of which will require removal of the current roof (Jim owns the building) and considerable renovation. These upgrades will undoubtedly happen in due time. My comment to Jim when he initially stopped to talk to me at the bar was that his little brewery has grown up. And it most certainly has. 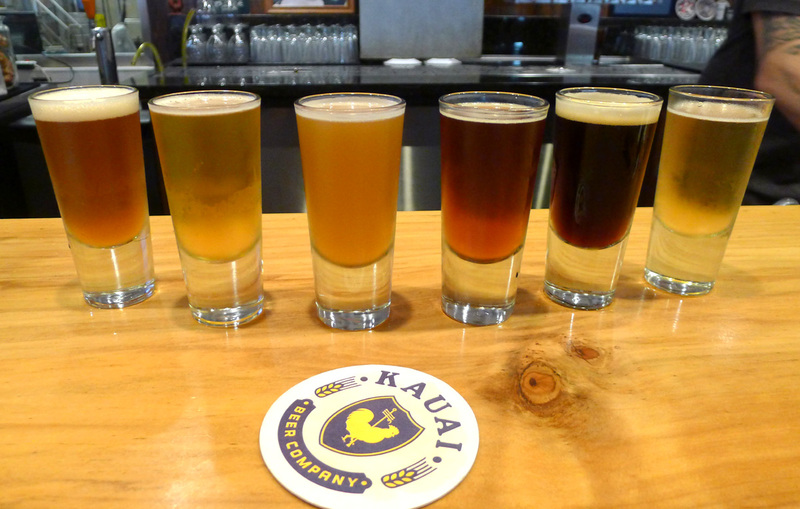 From nothing more than a shell several years ago, Kauai Beer Company has evolved into a solid business. My guess is it will continue to move forward as each upgrade is considered, planned and implemented. In case you're wondering, Kauai is still very much the beer desert I described in earlier posts. It isn't easy to find authentic craft beer here. The big beer companies seem to have a lock on the market, particularly in the resort areas. 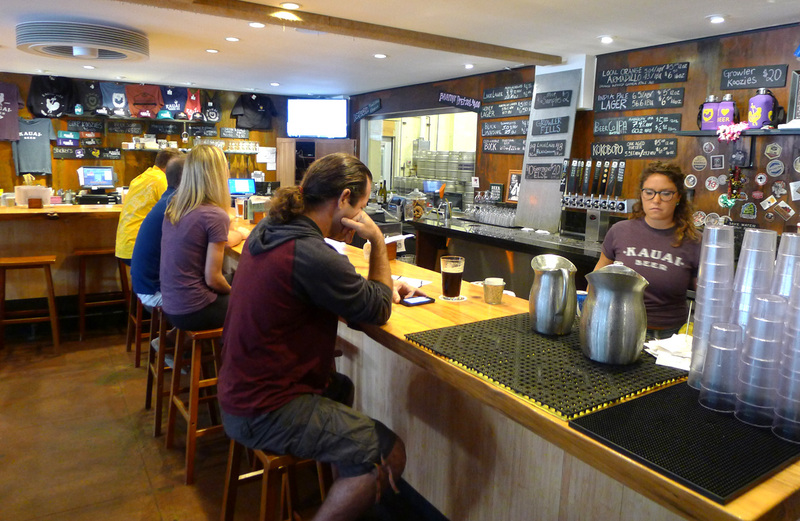 Which makes Kauai Beer Company an oasis for locals and tourists, mostly grown up and ready for future adventures.